Home » Lee Edition » VICTIM OF PERIPHERAL NEUROPATHY? Are you one of the Millions of Americans that suffer from peripheral neuropathy? Have you been told you have to deal with it, live with it, and rely on Gabapentin, Lyrica, Cymbalta, injections or other dangerous off label drugs with serious side effects. You see, it’s not your medical doctor’s fault, it’s the completely irrational medical system that continues to treat only the symptom and not the cause. Are you suffering from numbness, tingling, burning pain, deep stabbing pain, o f t e n diagnosed as peripheral neuropathy? Are you having balance problems or have the fear of becoming disabled, needing someone to take care of you and losing your independence? 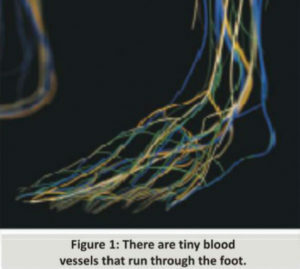 As you can see in Figure 2, as the blood vessels that surround the nerves start to die off. The nerves begin to shrink from the lack of all its oxygen, nutrients, and blood supply. When these nerves begin to die, symptoms such as numbness, tingling, burning pain, sharp deep stabbing pain, balance problems, and lastly fatal falls and injuries begin to appear. The main problem is that your doctor has relied on the “drug cocktail” and exploratory surgery approach which miserably fails. You actually think like a neuropathy expert more than you think. Let me give you an analogy. What do you think of when you see a wilting plant? Exactly! Water, sunlight, nutrients, take any toxins away from its environment for healing! A nerve is an organism just like a plant, so our goal in our clinic is simple. We must increase blood supply to the nerve so it can heal. But first, ask yourself this question. How many medications will it take to increase blood flow to the dying nerve? You are correct! Medications can not increase blood flow. With our 3 step process, we have a 90-95% success rate with neuropathy. One way we increase blood flow is by using cutting-edge technology such as lower level light therapy, also known as LLLT. The technology was discovered by NASA by treating wounds in space. LLT was approved by the FDA in 2001 and is at the forefront of neuropathy treatments. The low level light therapy creates a process called angiogenesis. Angiogenesis means “new blood vessels”. It’s like watering a plant. The more LLLT a nerve gets, the more it repairs itself, just like a plant would by getting more water, sunlight, and nutrients. In addition to LLT, we use a cutting-edge technology around a Nobel Prize winning concept allowing increased circulation to the extremities. educate the nerve back to normal function. By using a device that’s used in large hospital chains across the country for neuropathy, we are able to repair the damaged nerves, and start to make them durable once again. The most common mistakes neuropathy suffers make are to take the “it will go away on its own” or “the medications will get me better” mentality. Doing this for long periods can cause you to reach a point of no return. Call 239-317-8534 to reserve a spot to our upcoming seminar. Spots are limited to 17 guests.